This Italian variation on America’s favorite homemade cookie, chocolate chip, has less chocolate chips and replaces vanilla extract with almond extract and amaretto an almond flavored liqueur. The method of preparation for Amaretto Chocolate Chip Cookies is similar to chocolate chip cookies, but rather than placing a spoon full of cookie dough onto the baking sheets (drop cookies), the dough is refrigerated at least 30 minutes to make rolling it into balls easier (rolled cookies). The result is more uniformly shaped cookies. Rolled cookies take a little more time than chocolate chip cookies, but well worth the effort. Let the butter, shortening and eggs warm to room temperature. Using a stand mixer or hand mixer cream butter, shortening and sugars until smooth. Add eggs and beat 2 to 3 minutes until light and fluffy. Add amaretto and almond extract and beat 30 seconds. Combine baking soda with the flour and add to creamed mixture. Mix using low speed until the flour dough is uniform color. Mix in chocolate chips. Cover bowl and refrigerate at least 30 minutes or overnight. Lightly grease or coat 3 12x18 inch baking sheets with cooking spray, or line with parchment paper. 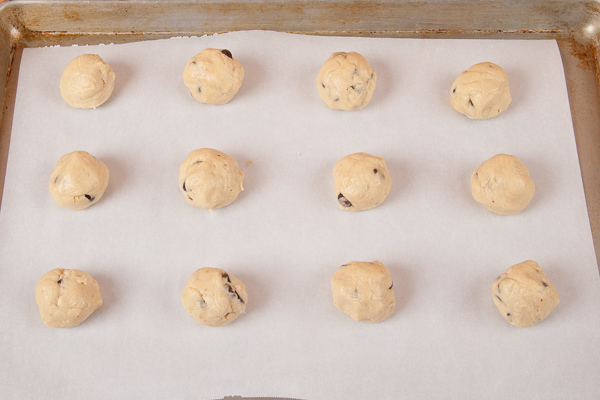 Roll dough into about 1 1/4-inch balls and place 2 inches apart on baking sheets. Bake 8 to 10 minutes or until lightly browned. 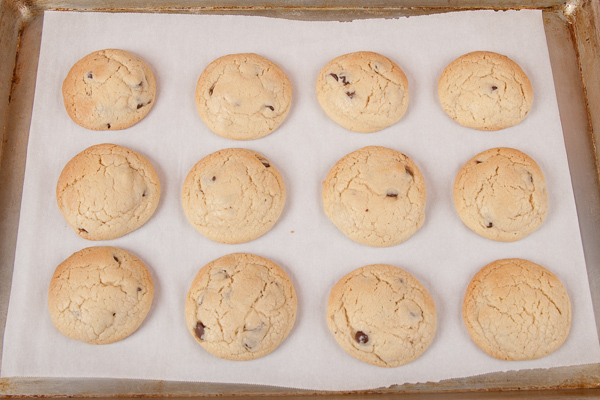 Cool in pan 2 to 3 minutes and then transfer cookies to cooling racks. Store in airtight container or freeze.